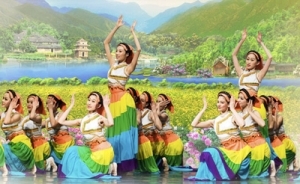 The ladies of the Yi ethnic group are known for styling their hair in a bun, wearing pleated skirts, and embroidering silver flowers on their collars. Their skirts often reach the ground and end in a wide hem. From top to bottom, the skirt features large colorful bands with red, yellow, and black being most popular. Traditional Yi attire is decorated with cross-stitch embroidery, as Yi girls are taught from a young age how to sew. The quality and lavish details testify to the wearer’s dexterity with the needle. 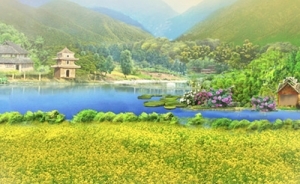 Shen Yun’s 2011 program featured an Yi ethnic dance inspired by the people of Yunnan province’s Red River region. Starting at three years of age, the girls there wear a special hat shaped like a rooster’s crest. It is decorated with silver spheres and exquisitely detailed embroidery. They wear these until they are married. The rooster crest hats represent luck and light, and are worn in hope of a happy and beautiful life.